There were a few things I left out when I originally wrote the review below. Only because I was trying to keep things short, and honestly I just forgot. However a couple are pretty important and should be mentioned. 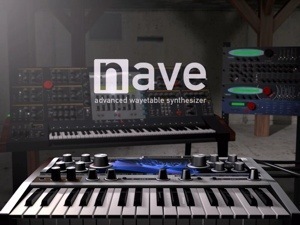 Yes, Nave is a polyphonic and monophonic synth. It has a 4 voice unison mode with adjustable width. It gets really wide, by the way. I find myself using it a lot. As for how many voices in total polyphony is concerned, I have been unable to locate an exact number. From what I’ve experienced it has more than I have fingers. Whatever the case, its plenty. 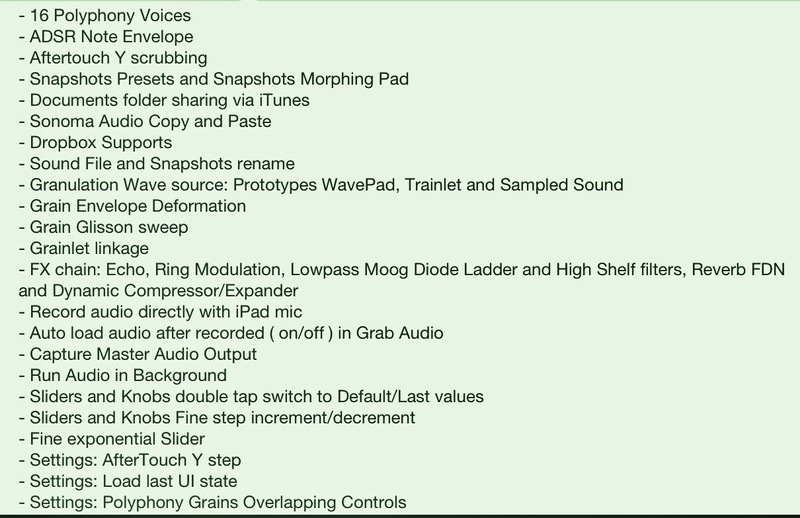 There’s also the speach synthesis which uses the device talk to text function to create new wavetables. That’s a strange one, but awfully cool anyway. 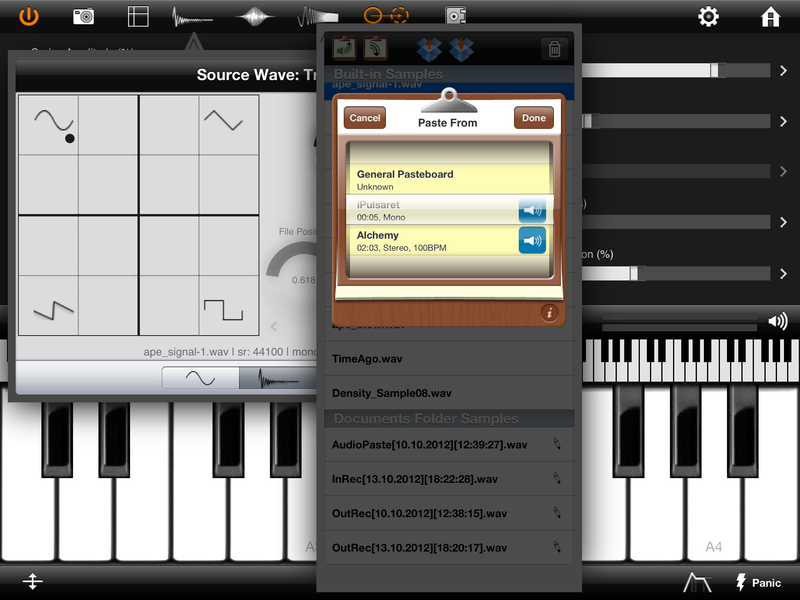 More importantly Nave allows one to import via pasteboard, their own audio files to create original wavetables. That’s sweet. I kind of just glanced at a mention of the “UberWave” function. It adds a big fat sound quality that puts a lot of edge on it. Its hard to explain, you really just gotta hear it. Its definitely better explained by Waldorf in the manual, but again to keep this short, I’m just going to suggest you visit the Nave page of their website for that and all the tech stuff. The link is down in the review itself. So there’s a couple more things. Sorry I didn’t mention these before. Nave has a lot of capabilities, and I can’t list them all. Most important is that Nave has an amazing sound quality for some powerful patch crafting and has become my daily synth of choice. Anyone who doesn’t get excited by this synth clearly has no pulse. Synthesizers just make me happy. Incredibly powerful ones such as Nave, make my head spin with joy. You’ve probably heard about Nave, seen the videos, or endured my merciless teasing. Now after 1.5 years of hard work and careful development, Nave is finally finished! As I am writing this it is with Apple pending review to be launched in the iTunes App Store any time now. I have been lucky to have had the opportunity to beta test Nave for a couple months leading up to this. 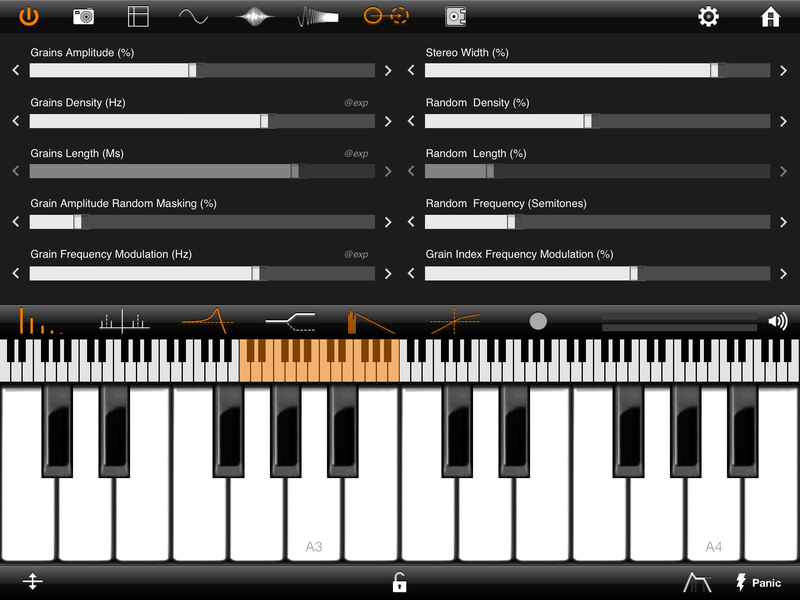 From day one, I’ve been very impressed with this powerful new synth made just for iOS. 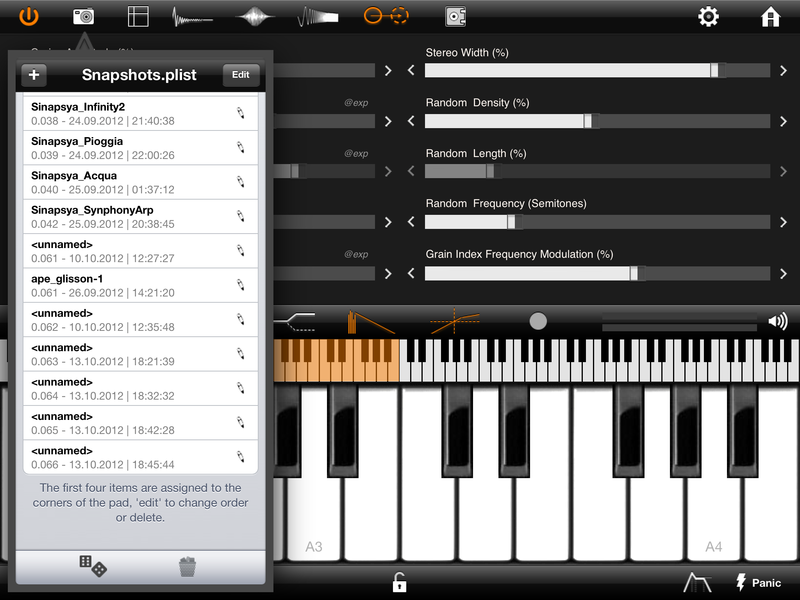 Waldorf has been making great software for a while, but this is their first for iOS. They joined with Tempo Rubato, who you may know of from the excellent NLog Synth Pro. Pretty solid development team if you ask me. 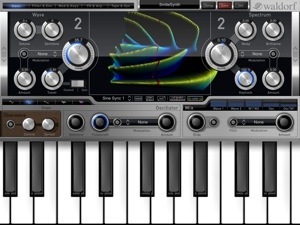 Nave is a powerful twin wavetable oscillator synthesizer with a single classic oscillator (with all the basic waveforms) and the pulse racing “Uberwave” function. 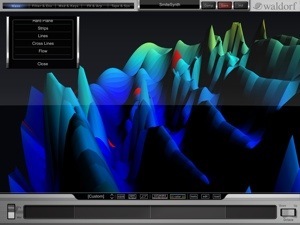 You have hands on control over numerous options to tweak the many choices of wavetables, (in full screen “Edit” mode) 7 different 3D views. 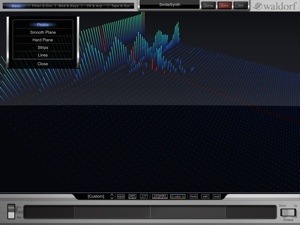 Very fine tuning is easily done by touch to fully customize any wavetable. Full ADSR envelope controls over each oscillator, 2 multi waveform LFOs, fully adjustable pitch/bend wheels and modulation options at every corner. The amount of modulation options really are nothing short of amazing. At last count there were 500 plus factory presets being shipped with Nave at launch. Nave is pure sound design heaven! The integrated ( and beautifully emulated ) Waldorf Multimode Filter with the Drive function that has a selection of 5 curve types to 4 location options offer you amazing control of the wavetable oscillators to craft the wildest of imagined sounds from morphing, teeth mashing leads on overdrive steroids, to silky and mesmerizing pads. The ten source to destination modulation matrix extends sound designing possibilities dramatically. Truly limitless. Playing Nave on screen has a couple options. It has a classic, scrolling virtual chromatic keyboard. Then there are the “Blades” which can have x/y modulations, and velocity programmed to them giving you full polyphonic modulation control. I got caught by my wife gesturing my fingers in strange massaging motions over the Blades manipulating the sound in a way she referred to as “Romantic”. Plugging in your MIDI controller/keyboard (iRig Keys in my case) was about as difficult as just that. Plug in, start playing. 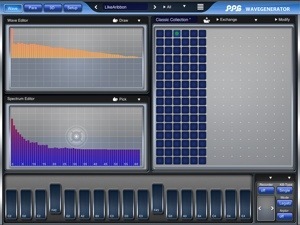 All significant parameters can be mapped and MIDI controlled either virtually or with compatible hardware. As for FX, Nave has that covered also. 7 effects units are onboard and sound really good. I actually like the reverb on this synth. A delay, chorus, phaser, flanger, 3 band EQ, and compressor round out the options. I have found each to sound excellent. Though, at times if I had applied the reverb with a few others and played some chords, I got a bit of clipping. Could have just been I forgot to close a background app, or the CPU on my iPad was over burdened. Lowering the amount of reverb used and set to %50 wet vs dry helped. That was on my iPad 3. No such experience was repeated on my iPad 4. On the same page with the FX, is a competent arpeggiator with better than normal options, but still kind of basic. That’s not a bad thing. 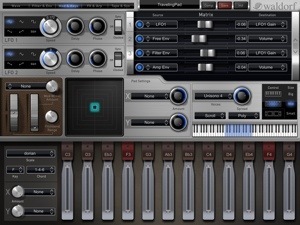 I actually like this arpeggiator better than most iOS synths. 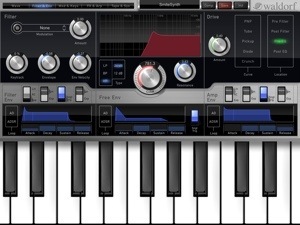 It has a fair amount of options to make some unique, and melodic patterns including your own notes. Using the arpeggiator with the 2 large programmable x/y pads adds much to experience. Nave is multi dimensional doing everything splendidly. All in all the specification list is quite large so please check out the Waldorf website for all the details. There’s too many to list here. Lastly is the vintage styled 4 track recorder. You could use it to make a whole Nave song, or sketch out some things. 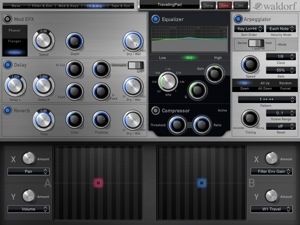 I’m enjoying using it to layer on some interesting and varied synth sounds for creative loops. Each track can be panned, leveled, split, and or duplicated. 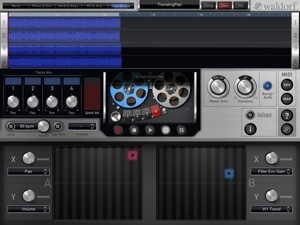 In loop mode (iPads 3&4) I heard some clicks where the loop ends meet, but they didn’t translate to the recording I made while using Audiobus to an output app. In addition to Audiobus input support Nave has AudioCopy/Paste, “Open In”, & Save to iTunes Folder. I’ve had no crashes, or weird mishaps at all with this final version of Nave. They did a great job with this ambitious synth, and it is full of impressive bits all around. If anything looks confusing there is a manual accessible from the “?” button on the “Tape” screen. The amount of tools and options for creating sounds strait from your imagination are fantastic. Nave has become one of my most favored iOS synths and I easily consider it a must have. The audio quality is second to none. This is one massive, beastly synth that raises the bar. Whatever the price is in your iTunes Store, it is my sincere and honest opinion it’ll be worth it. Yeah, I recommend Nave. Duh. 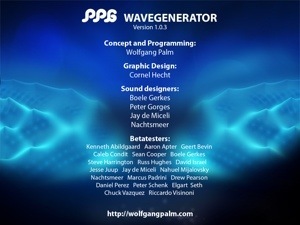 Here’s a couple more screen shots from the Wavetable edit full screen. You can even manipulate the colors.